We're pleased to bring you the news that the Royal Air Force has confirmed its flying participation at this summer's Air Tattoo. Joining the previously announced Red Arrows, who are flying their final displays at the Air Tattoo before heading off on their tour of the USA, are four more teams! 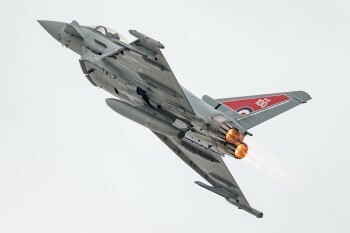 The RAF Typhoon Display Team will be demonstrating the multi-role BAE Systems Typhoon FGR.4 in a display that promises to showcase the aircraft's amazing performance, flown again by Flt Lt Jim Peterson. RAF training aircraft will also perform solo displays, in the form of the Shorts Tucano and Grob Tutor. Airshow favourites, the Battle of Britain Memorial Flight will also be flying at the show with the Lancaster, Spitfire and Hurricane.